This annual report covers the 2017 calendar and fiscal year for The Cotton Board, the oversight and administrative arm of the Cotton Research and Promotion Program (the “Program”). The objectives of the Program are to strengthen cotton’s competitive position and to maintain and expand domestic and foreignmarkets and uses for cotton by developing, funding, and implementing a coordinated plan of research and promotion. The Cotton Board is responsible for providing strategic leadership and oversight of the economic resources devoted to the Program. The Board’s membership, consisting of key stakeholders - U.S. cotton producers and importers of cotton apparel and other cotton products - brings a broad range of industry experience and insight to the Program. During 2017, the Cotton Board made available $74.23 million to Cotton Incorporated to carry out the research and promotion program. This was down slightly from $76 million in 2016, as decreased assessments necessitated a funding level that was more in line with revenue. After several years of revenue declines, the future looks brighter. I am confident funding levels will rebound quickly to around $80 million. The leadership of the Cotton Board and Cotton Incorporated used the several years of declining revenue to sharpen our strategic planning, narrow the scope of our activities, and focus our resources in critical areas. Throughout this period, we prioritized two things – finding innovative, cost-effective ways to drive demand and maintaining the exceptional, professional staff at Cotton Incorporated despite smaller budgets. We place a high value on the professionals who work for Cotton Incorporated, and they will be there working for me, for cotton importers, and for every U.S. cotton producer as our funding strengthens and we turn the tables on synthetic fibers. The Cotton Board maintains a strong collection rate, positive audit results, strong communication efforts, and effective reviews of Program activities. I am proud of the organization and its staff. We have significant challenges ahead of us, and we have some great opportunities. Cottonseed value, contamination, Fusarium Wilt Race 4 are significant threats that the Program is prepared to help the industry tackle. We are now seeing opportunity in telling our industry’s sustainability story and driving home the fact that cotton is a truly renewable, natural resource. Cotton Incorporated and its leadership are paving the way for innovative answers to these issues and more. We have a great partnership with Cotton Incorporated and USDA’s Agricultural Marketing Service. We could not have a successful program without the sense of unity and purpose that guides our organizations. Finally, I want to acknowledge The Cotton Board’s many dedicated Members and Alternates for their commitment and hard work throughout this past year. This ginner from Morganza, Louisiana, has learned many things from my fellow producers and from the representatives of brands and retailers that volunteer their time to help this program and our industry. The Cotton Board’s diverse membership helps separate the Cotton Research and Promotion Program from the pack. I can’t thank them enough for their insight and support. 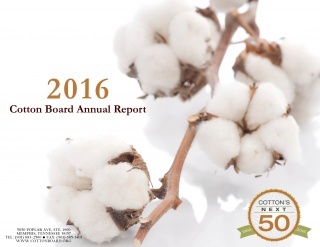 This annual report covers the 2016 calendar and fiscal year for The Cotton Board, the oversight and administrative arm of the Cotton Research and Promotion Program (the “Program”). The objectives of the Program are to strengthen cotton’s competitive position and to maintain and expand domestic and foreign markets and uses for cotton by developing, funding, and implementing a coordinated plan of research and promotion. The Cotton Board is responsible for providing strategic leadership and oversight of the economic resources devoted to the Program. The Board’s membership, consisting of key stakeholders - U.S. cotton producers and importers of cotton apparel and other cotton products - brings a broad range of industry experience and insight to the Program. During 2016, The Cotton Board made available $76 million to Cotton Incorporated to carry out the research and promotion program. This was down from $80 million in 2015, as decreased assessment revenues necessitated a funding level that was more in line with revenue. The leadership of the Cotton Board and Cotton Incorporated has developed a long-term budget plan as revenue continues to decline. Reserves are being used as needed in order to prevent sudden and disruptive decreases in program funding. As a result, Cotton Incorporated is able to maintain our most valuable resource, the professionals who work for Cotton Incorporated. The long-term budget plan is enabling the program to retain the benefit of this investment, while evaluating spending from the ground up, narrowing our focus and cementing the program’s commitment to projects and research that are more likely to enhance demand for cotton and improve margins throughout the industry. The program has “tightened its budget belt” and focused resources. I am proud of the foresight and thoughtful decisions that made this effort possible. I am confident the program will continue to generate significant returns for all stakeholders. 2016 marked the fiftieth anniversary of the Cotton Research and Promotion Program. Today’s industry leaders draw inspiration from this heritage as cotton again faces significant competitive challenges. As we enter cotton’s next 50 years, it is important to reflect on the vast array of accomplishments the Program has generated so far and renew our commitment to the same kind of hard work and dedication required to make cotton the preferred fiber for the world. Cotton Incorporated and its leadership are paving the way for innovative answers to the task of increasing demand. We have an incredibly strong partnership with Cotton Incorporated and USDA’s Agricultural Marketing Service. We could not have a successful program without the sense of unity and purpose that guides our organizations. Most importantly, I want to acknowledge The Cotton Board’s many dedicated Members and Alternates for their commitment and hard work throughout this past year. Thank you for your friendship and support. 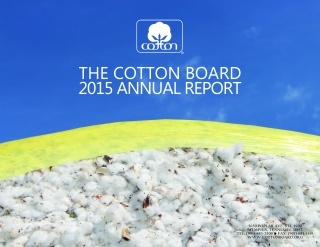 This annual report covers the 2015 calendar and fiscal year for The Cotton Board, the oversight and administrative arm of the Cotton Research and Promotion Program (the “Program”). The objectives of the Program are to strengthen cotton’s competitive position and to maintain and expand domestic and foreign markets and uses for cotton by developing, funding, and implementing a coordinated plan of research and promotion. The Cotton Board is responsible for providing strategic leadership and oversight of the economic resources devoted to the Program. The Board’s membership, consisting of key stakeholders - U.S. cotton producers and importers of cotton apparel and other cotton products - brings a broad range of industry experience and insight to the Program. During 2015, The Cotton Board maintained a funding level of $80 million to Cotton Incorporated despite overall declines in assessment revenue. This funding level necessitated a significant draw from reserves and led to an evaluation of longer-term funding levels (2016 and beyond) that are more in line with revenue. Reserves were established precisely to bridge annual gaps in revenue so that the Program can make long-term, predictable investments in projects and resources. Our most valuable resources are the professionals who work for Cotton Incorporated. It is important to manage our finances so that we can retain the benefit of this investment, but we cannot ignore the overall decline in revenue. Looking ahead, I am pleased that The Cotton Board and Cotton Incorporated are structuring future budgets from the ground up, narrowing our focus, and cementing our commitment to projects and research that are more likely to turn around demand for cotton and improve margins throughout our industry. We will bring budgets closer in line with revenue and sharpen our market promotion and research efforts while ensuring we continue to generate significant returns for all stakeholders in this program. The Cotton Board continues to maintain a strong collection rate, positive audit results, strong communication efforts, and effective reviews of Program activities. I am proud of the organization and its staff. Cotton Incorporated and its leadership continue to pave the way for innovative answers to the task of increasing demand. We have an incredibly strong partnership with Cotton Incorporated and USDA’s Agricultural Marketing Service. We could not have a successful program without the sense of unity and purpose that guides our organizations. Most importantly, I want to acknowledge The Cotton Board’s many dedicated Members and Alternates for their commitment and hard work throughout this past year. Thank you for your friendship and support. 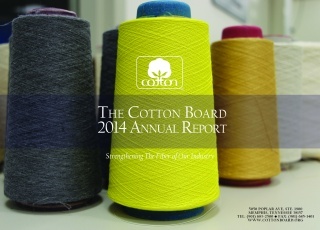 This annual report covers the 2014 calendar and fiscal year for The Cotton Board, the oversight and administrative arm of the Cotton Research and Promotion Program (the “Program”). The objectives of the Program are to strengthen cotton’s competitive position and to maintain and expand domestic and foreign markets and uses for cotton by developing, funding, and implementing a coordinated plan of research and promotion. The Cotton Board is responsible for providing strategic leadership and oversight of the economic resources devoted to the Program. The Board’s membership, consisting of key stakeholders - U.S. cotton producers and importers of cotton apparel and other cotton products - brings a broad range of industry experience and insight to the Program. During 2014, The Cotton Board provided $80 million in funding to Cotton Incorporated, enabling it to focus its expertise and enormous talent on the betterment of the cotton industry. With declines in overall income, maintaining this level of funding required a draw from reserves of $4.4 million. The Cotton Board determined, however, that a strong, long-term investment in the Program is critical in a highly competitive marketplace. The experts at Cotton Incorporated need the resources to keep cotton in the forefront of technology and fashion worldwide. Our united effort enhances our market impact and helps ensure a bright future for cotton. We thank Cotton Incorporated and its leadership for the sense of unity that guides our organizations. We sincerely appreciate the work of USDA’s Agricultural Marketing Service and its continued support of the Program. Finally, I send warm regards and thanks to The Cotton Board’s many dedicated Members and Alternates for their commitment and hard work throughout 2014 and 2015, and for their friendship and support. 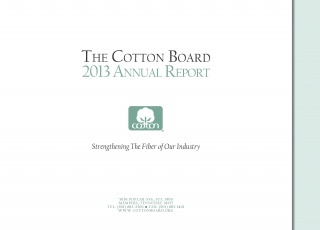 This annual report covers the 2013 calendar and fiscal year for The Cotton Board, the oversight and administrative arm of the Cotton Research and Promotion Program (the "Program"). The objectives of the Program are to strengthen cotton’s competitive position and to maintain and expand domestic and foreign markets and uses for cotton by developing, funding, and implementing a coordinated plan of research and promotion. The Cotton Board is responsible for providing strategic leadership and oversight of the economic resources devoted to the Program. The Board’s membership, consisting of key stakeholders - U.S. cotton producers and importers of cotton apparel and other cotton products - brings a broad range of industry experience and insight to the Program. During 2013, The Cotton Board provided a record $83 million in funding to Cotton Incorporated, enabling it to focus its expertise and enormous talent for the betterment of the cotton industry. This long-term investment pays tremendous dividends. The experts at Cotton Incorporated keep cotton in the forefront of technology and fashion worldwide. Our united effort enhances our market impact and helps ensure a bright future for cotton even as we face very strong competition in the market. We thank Cotton Incorporated and its leadership for the sense of unity that guides our organizations. We sincerely appreciate the work of USDA’s Agricultural Marketing Service and its continued support of the Program. Finally, I send warm regards and thanks to The Cotton Board’s many dedicated Members and Alternates for their commitment and hard work throughout 2013 and for their friendship and support. 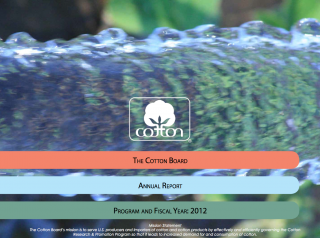 This annual report covers the 2012 calendar and fiscal year for The Cotton Board, the oversight and administrative arm of the Cotton Research and Promotion Program (the “Program”). As indicated by this report, The Cotton Board is responsible for providing the Program with strategic leadership and oversight of the economic resources devoted to the Program. The Program’s ongoing goal is to develop, fund and implement a coordinated plan of research and promotion designed to strengthen cotton’s competitive position and to maintain and expand domestic and foreign markets and uses for cotton. The Board’s membership, consisting of key stakeholders (U.S. cotton producers and importers of cotton apparel and other cotton products), brings a broad range of industry experience and insight to the Program. During 2012, The Cotton Board was able to increase funding for Cotton Incorporated from $71 to $80 million and approve an $83 million Cotton Incorporated budget for 2013 — the highest ever. The Cotton Board continues to maintain a strong collection rate, positive audit results, strong communication efforts, and effective reviews of Program activities. I would like to thank our partners at Cotton Incorporated for the very capable research and promotion efforts they develop and implement on behalf of the Program. I would also like to thank the USDA’s Agricultural Marketing Service for its continued support of the Program. Finally, thanks to The Cotton Board’s many dedicated Members and Alternates for their commitment and hard work throughout 2012.